This image of extended coral polyps was taken in the Flower Garden Banks National Marine Sanctuary in the Gulf of Mexico off the coast of Texas. 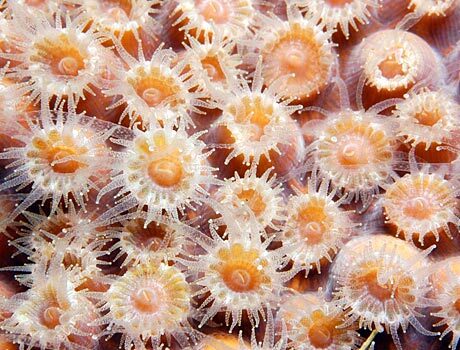 Corals are actually colonies of tiny animals that are closely related to sea anemones. They use their tentacles to capture bits of food in the water which they consume with a small mouth in the center of each polyp. This image was captured by G. P. Schmahl of the National Oceanic and Atmospheric Administration (NOAA).